The Oberoi Udaivilas is one of the most luxurious hotels in entire India. It’s located at the historical land of Udaipur Rajasthan which shows the traditional beauty of forts, palaces & monuments. The Oberoi Udaivilas offers the royal beauty of historical architecture, luxurious rooms, rippling fountains, transparent pools, boat riding, and outdoor activities. You will feel like you are living in the palace with Rajput (Kings) style. Although it is costliest too, if you have a good budget, the Oberoi Udaivilas hotel is must recommended for you. Know what are all time famous tourist destinations in India. The Taj Mahal Palace is one of the oldest and royal hotels located in Mumbai, India. It is the first choice for travellers to stay who visit Mumbai for holidays, vacations or business trip. It is the luxurious hotels in Mumbai with the beauty of Gateway of India and amazing night view over the infinite blue ocean, especially in moon night. The Taj Mahal offers luxurious rooms, spa facility, bars, nightclubs, fitness club, swimming pool, shopping centre, restaurant/cafe and more-n-more what a tourist can expect from a world-class hotel. The Taj Palace is no doubt one of the best top 10 hotels in India. The Oberoi Rajvilas is one of most famous, costliest and royal five-star hotel is Jaipur Rajasthan. It is famous for its luxurious renowned rooms, royal villas, private pools, gardens, and the incredible lakes view with the beauty of old Rajasthani fort style. There is also a good facility for business and corporate meetings with secretarial services to make your business/corporate meeting/event a success. If you want to check more options in Jaipur, check out the post about the best 5-star hotels in Jaipur. The Oberoi hotel (Mumbai) is the part of The Oberoi group which is best known for its most luxurious hotels in India. The Oberoi hotel is one of the main competitors of The Taj Palace in Mumbai which offers the Presidential Suite, Premier Suite, Premier Ocean View Room, Oberoi executive ocean suite, deluxe and luxury rooms. It also offers world-class night bars, pubs, nightclubs, fitness centre, spa, salon with the luxurious facility. The Oberoi is the first choice of travellers who visit Mumbai for holidays, business meeting, or a short break etc. Situated at the top point of magnificent Himalaya, Wildflower Hall is the best luxurious hotel at the high hills point of Shimla. You can enjoy there swimming pools, spa and sun beds at the top of Shimla mountains. It provides luxurious rooms, conference hall, business centre, health clubs etc. It also offers adventures activities like trekking, mountain bike riding, archery, billiards and more. Edited: Hey!! Don’t miss the detailed information on top 5 star hotels in Goa if you’re looking any high luxury resort to stay in Goa. Leela Palace Kempinski is one of the best luxury hotels in the garden city Bangalore. The royal architecture, rich golden shaded infrastructure, and ornate ceilings make it differ from any other five star hotels in Bangalore. It offers separate swimming pools, business rooms, Ayurveda centre, clubs, bars, spa and world-class royal premiere & deluxe rooms which offer all available facilities that an excellent class deluxe room deserves. The Leela Palace Kempinski New Delhi, another royal hotel of the Leela Palace Kempinski Group. One of the best 4-5 star luxury hotel in New Delhi which is very close to Prime Minister’s residence, Rashtrapati Bhavan (President House), the Secretariat, and Qutub Minar (One of the famous historical monument of Delhi, even India). It offers more than 250 luxurious rooms, expensive but premium restaurants, an exclusive spa, bars and nightclubs make it so special. This hotel is highly recommended by travellers, honeymooners, corporate sector travellers, professionals, and premium customers. 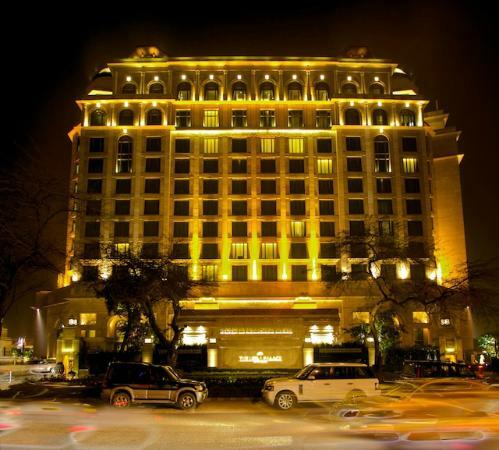 Moreover, you can also check out few other top 5 star hotels in Delhi. The Vivanta by Taj, located at Willingdon Island with the outstanding view of Kochi harbour and natural beauty of green-blues beaches. You can experience there special sea foods, Thai foods, local Kochi foods and best-known barbecue foods. It offers luxurious room facility with the beaches view & great hospitality. The best thing about The Vivanta, you can enjoy boat cruise with the facility for cocktails/lunch/dinner which makes it different than any other 5 star hotels in India. So, these are India’s top 10 most recommended hotels based on reviews shared by travellers. If you like/dislike this, post your valuable comment below. I will happy to hear you. Marina Bay Sands Hotel, Singapore – Luxury at its Best! Hi Gaurav Kumar Srivastava,thanks for the information. Glad to find a query on this post. But Shekhar, to know most accurate and regularly updated information about Munnar hotels, visit Makemytrip.com or Expedia. Thanks. I really appreciate your suggestion Vishal. Your suggested hotels listing are definitely looking competitive, but I mentioned only those hotels name which are top rated on top travel reviews & rating website ‘TripAdvisor’. I only listed those 5 star hotels which are unbeaten in every category and hold the top rating in category of top 5 star hotels of India. Above hotels info is not sorted according to largest or biggest, all has described on the basis on highly luxuriously, top rating and maximum numbers of positive customer reviews on TripAdvisor. Hi Ajit. Its a pleasure to know you found this hotels blog helpful. Hello Mr.Srivastava, This is Piyush Shastry and I am studying Hotel Management. I am looking for the Top-25 5-Star Hotels in India for an upcoming project. Can you please provide me with the information? Here you can check top 25 hotels of India rated by leading travel website TripAdvisor. Hope, you found that list helpful. MANY PEOPLE DO NOT KNOW WHO ARE CHOLAS they are indian tamil people who ruled south tamil nadu and malaysia singapore half indonesia etc. Hi Gilbert. I only listed those hotels which have more than 90% of positive rating on TripAdvisor. However, it isn’t possible to list all luxury five hotel resort and hotel. Good to see the post! @Amit: Your suggestion is absolutely appreciable. I’ll try to capture this topic on my travel blog once I get more information related tourist hostels systems in India. Thanks for approaching me! Glad to know you found this hotels guide helpful! Hello. Please suggest me the best hotel in chennai. I too have an assignment. Can you please tell me India’s oldest language? Hello Mr. Srivastava, thanks to these updates. Can you provide the details about new upcoming hotel projects in India? Sorry Ram! I haven’t accurate information about any new hotel and resort projects in India. Great list,I found the picture of Wildflower Hall, Shimla most interesting , it like the ones that we see in TV’s of hotels abroad I’am amazed its really in Shimla. Though there are a plethora of luxury hotels in India, I would say these 10 hotels are the best when you want to live opulently in your journey and take home the best memories of your life. But, if you see, budget-friendly hotels are the most demanded these days as they provide all the modern amenities with much less price than the luxury hotels. And the tourists can get these hotels in almost every tourist attractions. It’ll help them to save money on their accommodation and can finance another trip to a new destination. I think you should definitely add hotel Lesutra in the list, The unique theme and the mesmerising interiors of the hotel make it one the of the best luxury boutique hotel in India I’ve visited.